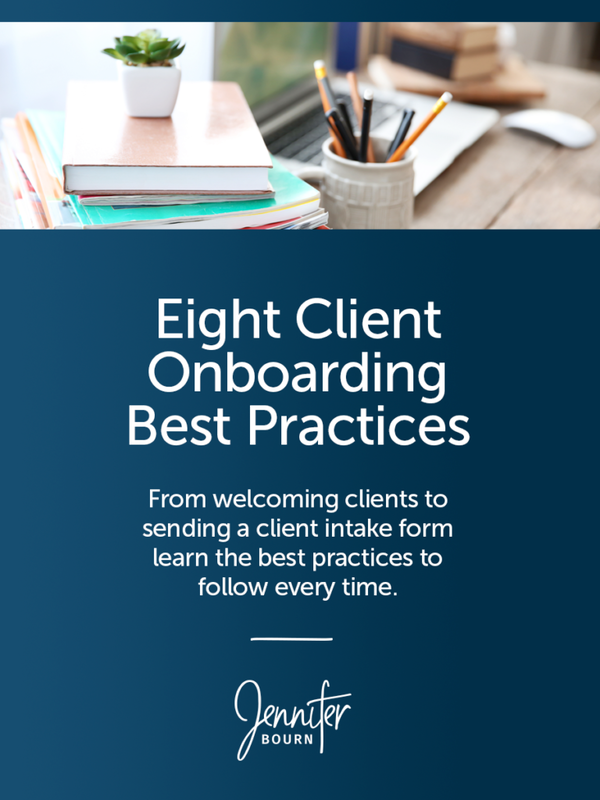 From welcoming new clients to sending a client intake form, review the eight best practices in new client onboarding. The sales call went smoothly, the prospect is a great fit, you sent the contract, your new client signed it, and they paid the deposit… now what? Do you send them your client intake form or discovery questionnaire? I hope not. How the project starts will set the tone for the entire project, your relationship, and their perception of your business. Instead of just sending over an intake questionnaire, you need to welcome your clients to the project and your business in a powerful and professional way through a carefully-crafted new client onboarding system. The primary thing to remember about onboarding is that it is first and foremost about client care, support, and education. Then, if done right, it will also free up your time, reduce project hours, and increase profitability. Setup your client onboarding system to begin the minute the client pays their deposit. Send a friendly welcome message right away and share what they can expect — don’t make your clients wait and wonder what happens next. Set expectations and establish boundaries early. Communicate what you expect of the client and what the client can expect of you and establish when you’re available and when you’re not. Also, review what happens if the client needs to change the scope of work, adjust the timeline, or make additional revisions. From contract to conversation, to written emails and project notes, when communicating about a project, always use the same language, terms, and phrases. Avoid industry jargon as much as possible and keep all communications simple and crystal clear. If you do need to use technical terms or jargon, consider providing clients a glossary of terms at the start of the project. Even if you already explained your process in detail during the sales all and included the process breakdown in your contract, provide it to clients one more time during onboarding. Remember, your clients don’t have the same knowledge and expertise you do, they are busy, they forget things, and they may not keep the signed contract readily available. Walk the client through your process, share how things are going to work and what comes next step-by-step. A simple way to reduce friction, overcome obstacles, and avoid potential “sticky situations” later in the project is to address the questions asked most by clients up front. Consider creating an FAQ or tips sheet for new clients to answer questions and address concerns or issues past clients have had before they become an issue. As new clients ask questions, update the FAQ or tips sheet. Often clients have questions and get stuck, but never ask for help because they think they are bugging you or they are embarrassed about what they don’t know. In all of your communications, remind your clients that you’re here to support them and answer their questions. Let them know that it’s okay if they don’t know what a word or phrase means, aren’t sure what to do, need some guidance, or want to talk through something they read online. It’s part of your job to make sure they feel confident asking for help and to be there when they need support or reassurance. Provide a discovery questionnaire or client intake form to gather information about the client’s business, target market, and brand, as well as what is and is not working in their business. Explore why they are investing in this project, what requirements they have, what their goals are, and what actions they are currently taking to achieve them. Some of this information may revisit what you discussed in the initial sales conversations, but since then, the client has likely gained clarity about the project and this is your chance to get the information you need in writing. QUICK TIP: When formulating the questions, think about the information you may need when writing a future case study. Once your new client onboarding process is documented and the system is created, it’s time to either delegate the management of the system to a team member or automate the system to run automatically without you. When I created our client onboarding system in 2011, I didn’t want to delegate something as important as onboarding a new client to a subcontractor or virtual assistant and I didn’t want to hire a new team member, so I chose to automate the process. Using behavioral triggers, I setup the onboarding system to start when the deposit is paid. This way I knew that my new client was being cared for and educated even if I was traveling for work, on vacation, sick, or busy with other clients. This freed up a huge amount of my time, created more flexibility in my schedule, and increased the profit margin on every project. If you automate the onboarding process, let your client know. Tell them the process has been meticulously designed to deliver maximum value, make sure that nothing falls through the cracks, and ensure every client has an extraordinary experience. Plus, remind them once more that they can contact you at any time with questions. The most common objection I hear when talking with others about new client onboarding is that it depersonalizes the client relationship, but that couldn’t be farther from the truth. The reality is that creating an onboarding system helps you care for your clients more consistently and provide better support. By carefully planning, organizing, and creating the information your clients need most at the start of the project upfront, you lower project management hours, reduce email back-and-forth, and eliminate stress because everything is taken care of for you. And, when you spend less time on administrative tasks, those value hours can be shifted to website strategy, customer journey mapping, conversion planning, design, and development. More of the project is spent on strategy or feature engineering, which will result in a better overall end product. Remember, the entire premise behind the creation of a new client onboarding process is providing better, more consistent service and delivering an extraordinary experience. If you sell website services and have yet to add systems like this to your business, I invite you to check out Profitable Project Plan. It’s a business training course for web designers and developers that walks you through an entire website project, from sales call to post-launch follow up, from the client management perspective — and it gives you every email, call outline, and client resource already created and ready to use so you don’t have to start from scratch. ABOUT THE AUTHOR: Jennifer Bourn is founding partner at Bourn Creative, a full service design and development company specializing in WordPress. With twenty years in the industry under her belt, she is an award-winning designer who consults on branding, website strategy, and content strategy. Jennifer speaks often, delivering workshops and keynote presentations, blogs about food and travel at Inspired Imperfection, co-organizes the Sacramento WordPress Meetup and WordCamp Sacramento, and writes often for other websites on freelancing, client services, blogging, marketing, websites, and branding. Get exclusive offers, insights, and resources to help grow your business with more clarity and greater ease. No long commitments or big packages, just quick advice, paid by the minute, right when you need it.